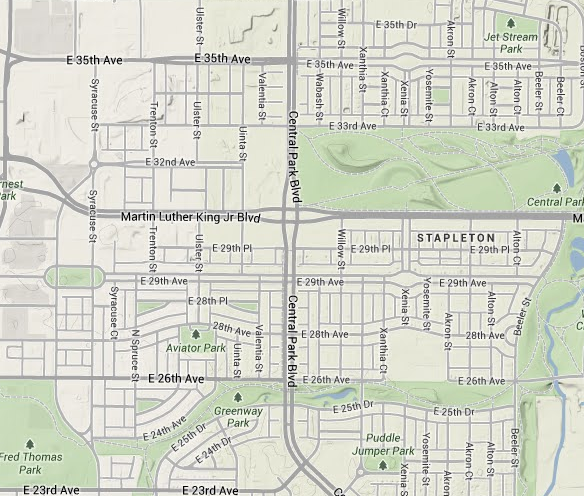 each of which happens to be a railroad suburb. Railroad suburbs were primarily developed during the Victorian era, fin-de-siècle, and into the 1920s. Aping developers' success in using streetcar lines to sell new housing, several railroads decided to enter the development game themselves and build "New Towns" lineside. This pattern--small, semi-dispersed centers of population highly centralized around train stations (a major railroad suburb giveaway is when a train station lies at one end of Main Street) became a primary mode of outward urban expansion for the better part of a century, and has left us a rich heritage of the nicest, leafiest communities in cities all across the nation. And, despite catastrophic disinvestment in anything that wasn't a house farm from the 1950s to the early 2000s, railroad suburbs continued to be the effective archetype of quality American community. New Urbanism got its start replicating railroad suburbs as new towns--even if the original railroad discontinued passenger service, the railroad suburb is, for all intents and purposes, a new town. Duany and Plater-Zyberk folded in some Southern Baroque town planning tradition, and--voilà!--an alternative to house farms, Levittown tracts, and meandering anti-grids was born. There are profound implications to this. First, one of the great successes of the movement is the re-creation of the railroad suburb. Transit-Oriented Development, an idea about as old as New Urbanism, is (in essence) a manner of development built on the workings of a railroad suburb. 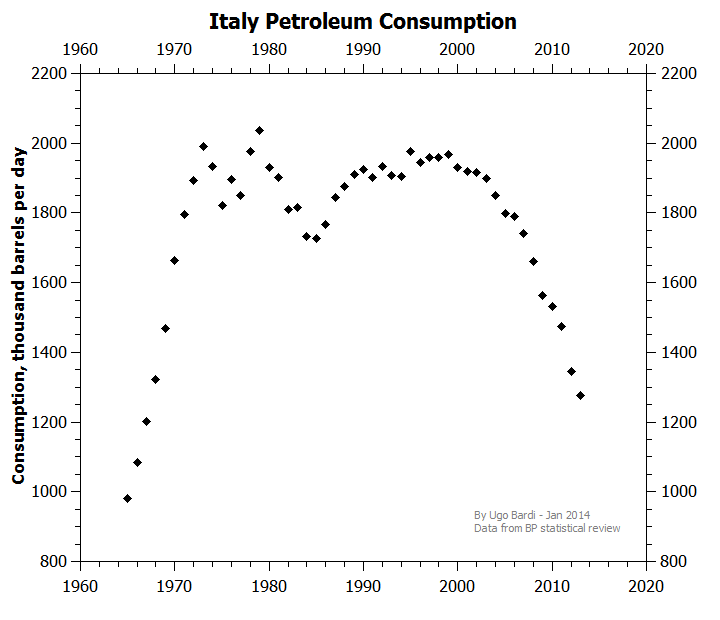 In the eventuality transportation policy changes--as it must, if Italy is at the vanguard of the trend--we have reclaimed the development model associated with a smaller, smarter, more compact type of urbanism and town-building. The key becomes, then, developing the right transportation policy: Most cities have enormous wealths of historical (largely disused) potential commuter rail lines--lines on which, were they active, we can hang New Urbanist (re)developments and intensification...These should be the avenues of growth in metros. A minimum wage indexed to (a) local CoL and (b) inflation would (should) yield a minimum wage with equivalent local buying power, which I would argue constitutes the key "equal protection" here. That is to say: a standard minimum wage of $10/hr buys a lot more in Alabama than California. But an indexed minimum wage should be designed such that the same amount of work-hours would be needed to buy, for example, a month of rent in Alabama as in California (and furthermore, that the amount of work-hours needed to buy a month of rent in either would be the same at any given time). That would be the equal protection a minimum wage provides. One way of implementing this idea would be for the federal government to not set any minimum wage, but rather set a standard buying power for a minimum wage. 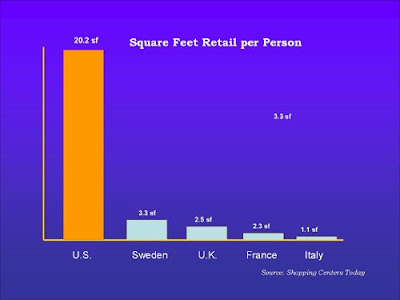 States would have a legal obligation (mandate) so set a minimum wage equivalent to this buying power; other entities (like cities, counties, and municipalities) can augment this as they see fit, based on local buying power. Σ(i=1, n=5)a(i), that is, the summation of the other costs^^. The state's responsibility, then, would be to index these requirements to prevailing local costs. Once those costs are ascertained, the minimum hourly wage becomes 1/160 this cost^^^. Cost-indexing it also has the nice side effect of inflation-indexing it; the state's cost index would be required to be updated annually; a state found to be using a cost index more than three years out of date would be subject to the withholding of federal funds (and class-action suits). These guarantees are extended on the condition of employment (as is implied by their structure as a minimum wage cost index). To have truly universal economic freedoms, however, one needs to find some way of extending certain of these guarantees to the unemployed. This, then becomes the next challenge. *Gas, water, electric, (mobile, not home) phone, Internet. Yes, this implies a right to Internet access. I think it's essential for doing much of anything nowadays, don't you? **Why? Well, (a) regardless of what zoning enforces, at this level of income, car ownership is a very expensive luxury, and we don't want to encode low cost/benefit ratio things (like car ownership giving access to jobs), and (b) our nation's bike system and bike culture are not yet developed to the point where universal bike access would be a fair formal statement of the right to transportation. ***60k Cal = 2k Cal/day * 30 days; 90k Cal = 3k Cal/day * 30 days; that is, the daily caloric intake generally needed to maintain weight for women and (slightly greater than) men, respectively. ^TBH, I have no idea how to calculate this cost, although what I have in mind is the cost of completely replacing a "professional" wardrobe, at outlet prices, every three years--hence 1/3 the cost/year, 1/12 that cost/month, 1/3*1/12=1/36. ^^Based on the budgeting principle that half of one's income should go to the aforementioned outlays; that is, the minimum wage should be tailored to the lowest feasible rate which one can keep a balanced budget. ^^^The costs being computed monthly: four weeks in a month, so 1/4 the cost weekly; 40 hours in a full-time workweek, so 1/40 the weekly cost hourly; 1/4*1/40=1/160, i.e. one works 90 hrs/mth to make ends meet, and 160 hrs/mth to make a living wage. which would (4) extirpate sales tax revenues in most locations--shrinking the size footprint of the transportation slush fund. This is consistent with "tail fattening" (think Nassim Taleb)--especially the kind that, to reduce or mitigate risk now, kicks it down the road, compounding it when the interest's due. The only real long-term solution is--as I have said before and I will say again--conversion to a user fees-based system for access-managed roads, and massive reductions in maintained infrastructure for all general-access byways. 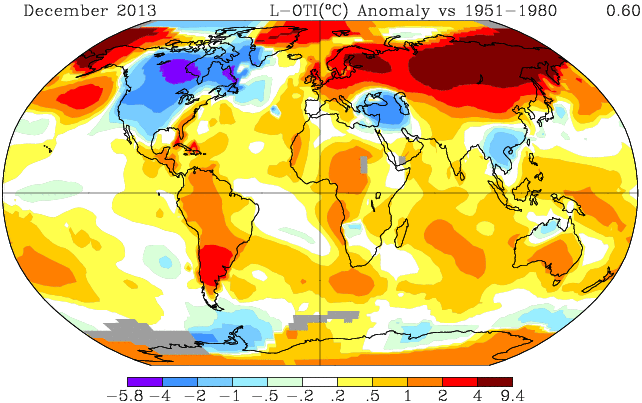 This image is the global temperature-deviation-from-mean chart as of December 2013. It is published by NASA's Goddard Institute. On it, you can clearly see two things: the polar vortex, and where the polar vortex is supposed to be. It turns out that the circumpolar whirl over the Arctic is elliptical and hence has two nodes. One normally lies over Baffin Island; the other, northeastern Siberia (Yakutia? Chukotka?). This is contrasted with Antarctica's polar vortex, which is stabler with only one node over the Ross Ice Shelf; the best guess for why that is, is because the Southern Hemisphere has a landmass at the pole, and the Northern, an ocean. The thing about an ellipse, though, is that it is less stable than a circle. Right now the Antarctic whirl looks to be between Ross and Graham Land. But look at that deep burgundy in Siberia! Hypothesis time: Warm air is pushing the Siberian node of the Arctic whirl into the ocean; this in turn is displacing the Baffin Island node into eastern continental North America. Hypothesis #2: The greater variability of the Arctic whirl (relative to the Antarctic's) has something to do with the ice age cycle of the past five million years. It is notable, for example, that the southernmost extent of the recent polar vortex broadly parallels, in latitude, the southernmost extent of glaciation historically associated with ice ages. ...And #3: Perhaps the proximate cause of the ice age cycle is the destabilization of the Arctic whirl? But if that is the case, what catalyzes it? Even so, the East Side Tunnel continues to have regional use. 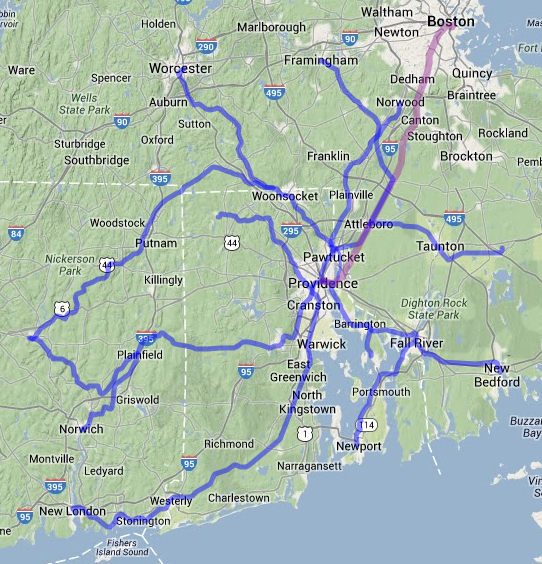 It is by far the best access alignment from Providence to cities to the southeast--Newport, Bristol, Fall River, and New Bedford. Indeed, it was historically used to provide commuter service from Providence to those latter two cities. 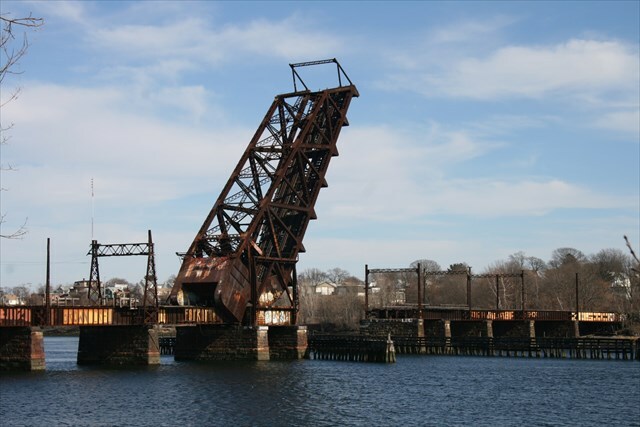 While the closure and demolition of the Slade's Ferry Bridge severed the link between Providence and Fall River and thence Newport, it does not appear that the New Haven ever actually linked the route from Fall River to New Bedford with its line from Myricks to Newport. 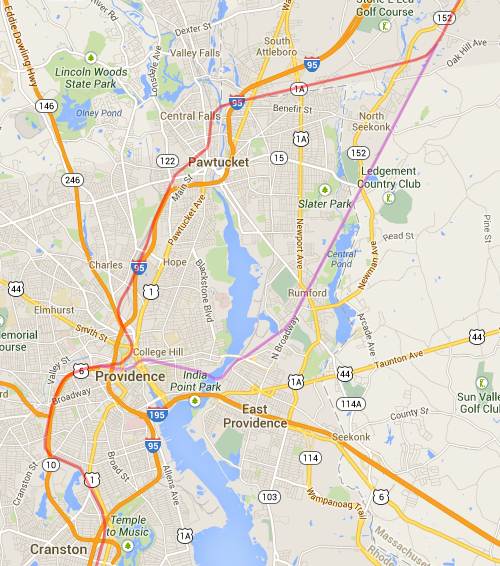 Figure 1 shows commuter rail to southeastern Rhode Island using only former New Haven lines. Fig. 1. Historical NH alignments from Providence SE. Follow the alignments, however, and you'll notice a pattern. 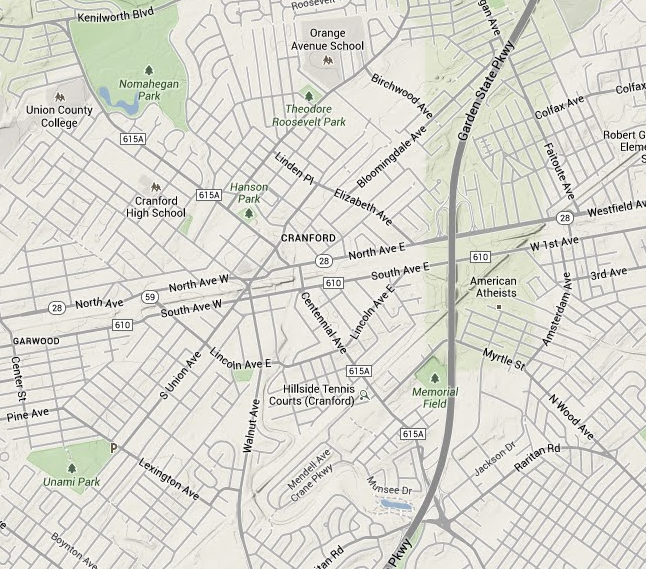 Two major alignments historically linked Providence and Newport; they diverged at Fall River. One route linked to the Bristol branch at Warren; the other route ran up to Taunton and around via Attleboro back to Providence. Both are highly inferior alignments today. The implication is that any workable commuter rail from Providence southeast, which hits the four natural termini, must of necessity deal with the region's challenging topography--specifically its strewn-about fjordlike bays. Of particular interest is the Mount Hope Bay, whose head is the Taunton River estuary up by Fall River, and mouth flows into the Narragansett Bay just south of Bristol, at the conveniently-named Bristol Point. New Haven easements are available all around Mount Hope Bay, but none provide a good crossing of Mount Hope Bay. Fig. 2. Hypothetical single crossing of Mt. 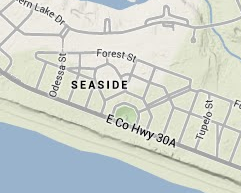 Hope Bay, superimposed on existing or available rail easements in the area. 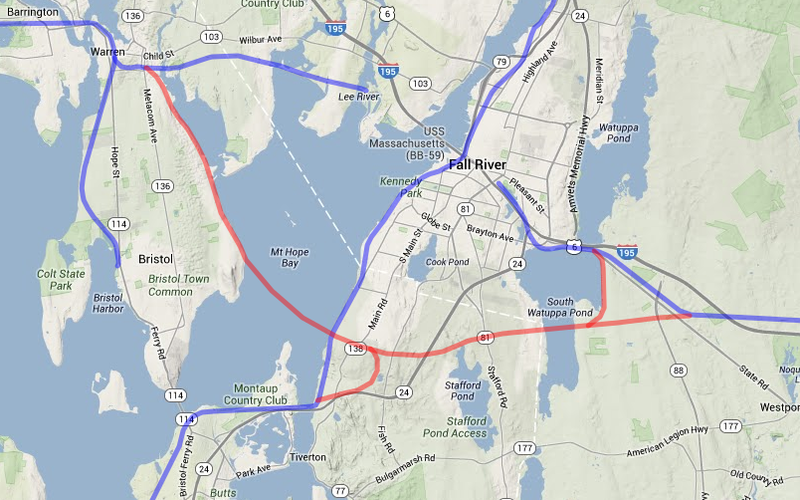 Reasons against further pursuit--long high bridge requiring access lines to New Bedford (right), Newport (bottom), and Fall River, as well as an excessive greenfield alignment cf. a two-crossing approach--are self-evident. 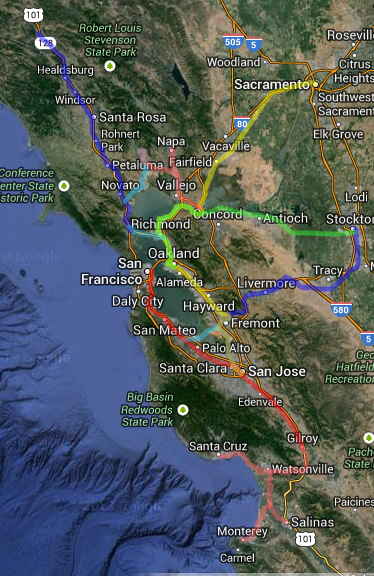 Nearly every other potential single crossing of the bay yields the same, inferior, results. The bay also demands two crossings. While a single crossing through its middle would theoretically be superior, such a crossing would (a) happen at its widest extent, requiring more than double the superstructure required by crossings at its head and mouth, (b) demand construction of lengthy new alignments to the crossing, and (c) induce excessive branching, needing no less than four different lines to reach each terminus. By contrast, the two-crossing approach allows for two lines--Bristol and Newport would be served by the same line, and Fall River and New Bedford the other. 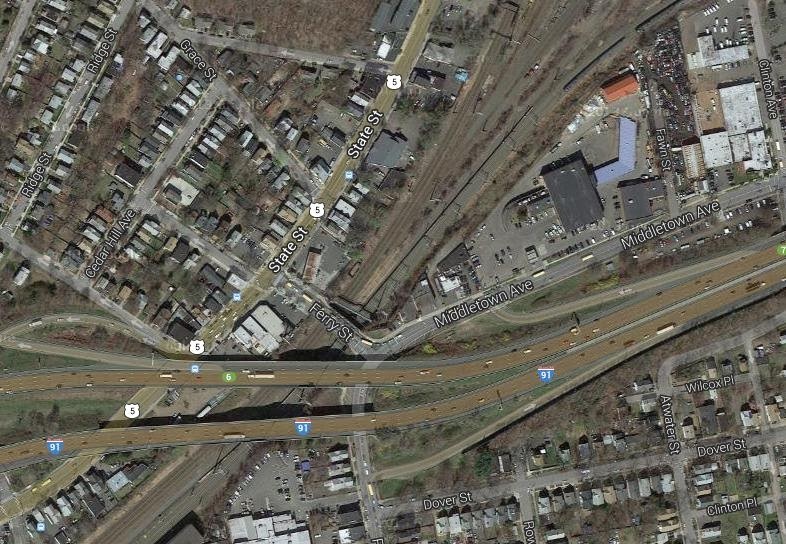 The Somerset Branch, a trace alignment the New Haven abandoned at least prior to 1948. This alignment is salvageable from the junction with the Bristol Branch east to the Lee River crossing, just beyond which the Brayton Point power plant has obliterated the ROW*. 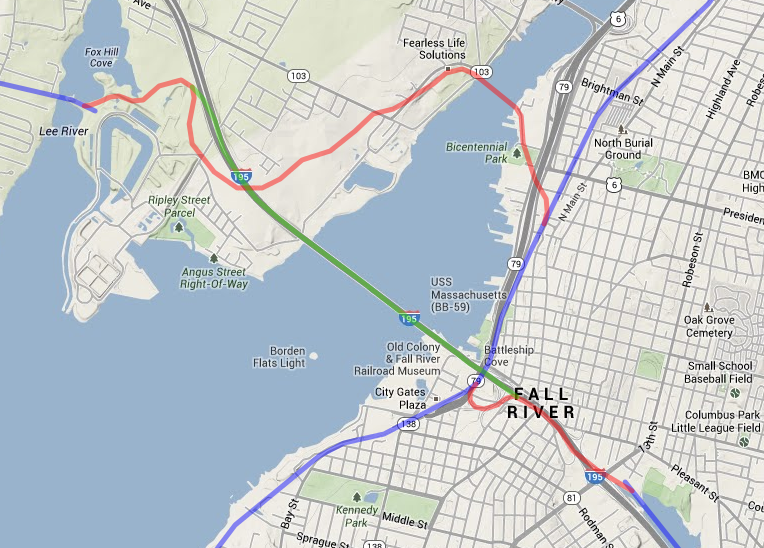 This route used to extend across Slade's Ferry Bridge into Fall River. The Watuppa Branch, a good-quality easement from the former mills at the head of the Quequechan to New Bedford. The Slade's Ferry alignment with a new alignment built up the Quequechan's remnants to the Watuppa Branch. These are shown in Figure 3, below. Note that the I-195 alignment, in green, is a good mile less than the Slade's Ferry alignment--thereby optimizing the former. Fig. 3. Links across the Taunton. In red: the Slade's Ferry alignment that "more-or-less" shadows what's left of the NH alignment; in green, a more direct alignment up the I-195 corridor. Notice how green is dramatically shorter. Remember what we said about a single-bridge alignment and excessive branching? A Taunton crossing following the I-195 alignment will by necessity make a cutoff down to the old NH alignment extremely difficult, and furthermore, impinge on potential station sites. No, it is better here to have the station to Boston riverside, and the one to Providence downtown. 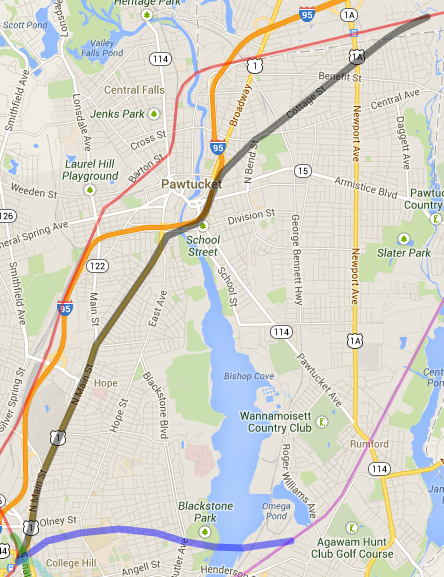 As previously stated, a Providence-Fall River-Newport alignment is relatively circuitous. If we want to optimize for straightness (and stay of out Massachusetts), we want a Providence-Bristol-Newport alignment. Such a line demands a crossing of the Mount Hope Bay by Bristol Point. On the Aquidneck Island (Newport) side of the bay, this is easy. 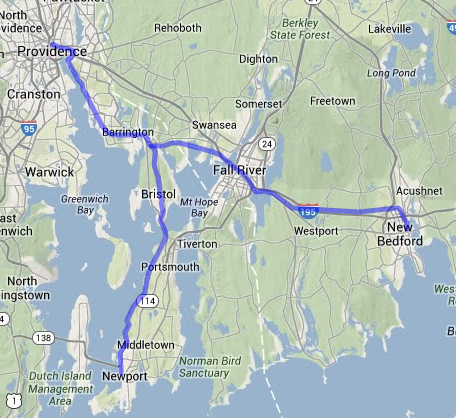 The NH alignment closely parallels the shore, and the geography allows for a gentle turn onto a bay crossing. Any ramp up can be built alongside the existing alignment. Far harder is the Bristol Peninsula. The former NH alignment there ran water level as well, but ended in downtown Bristol. Extending from it would require carving out a new waterfront easement, as well as raising track level to the clearance required across Mount Hope Bay. 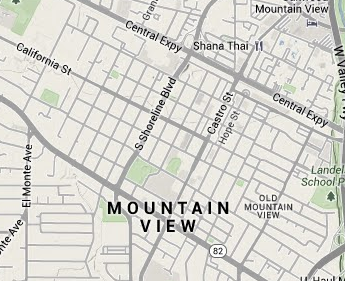 Far better is a power alignment heading straight down the center of the peninsula. 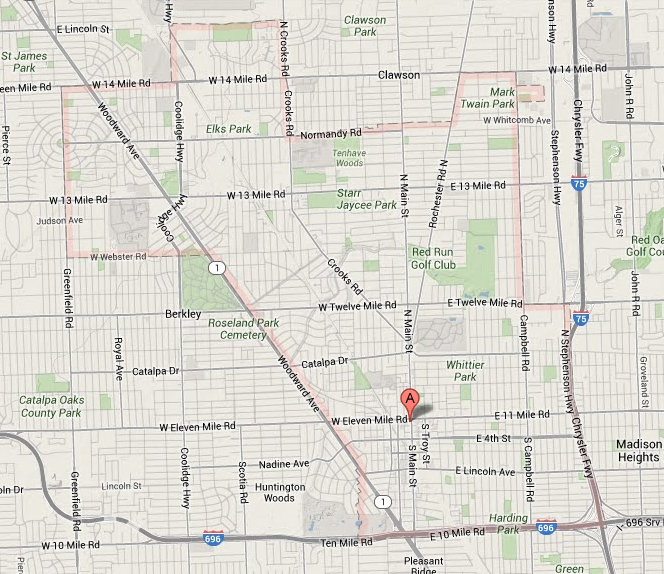 This alignment only extends as far south as Gooding Avenue, however. Extending it further requires cutting through a smallish park and following metes-and-bounds boundaries to minimize takings; it is possible to continue the alignment without significant disruption until between State and Franklin Streets. At State, entering into a section of town becomes unavoidable; even with an alignment designed to run behind street lots, properties will have to be taken at the cross streets. At Mount Hope Avenue, the optimal easement course curves across Dewolf Avenue through a couple of largish empty lots to run behind Antony Avenue. This, among other things, brings it across the buildup border at Woodlawn Avenue in the woods south of Wolf Cemetery. 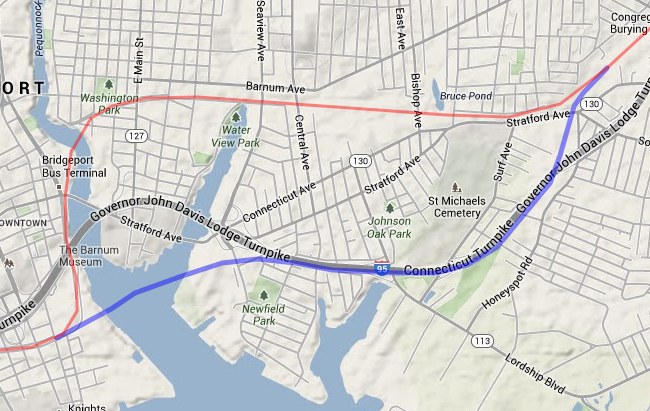 The proposed route then curves along Metacom Avenue and Ferry Road, alongside Roger Williams University, as it prepares to cross Mount Hope Bay. 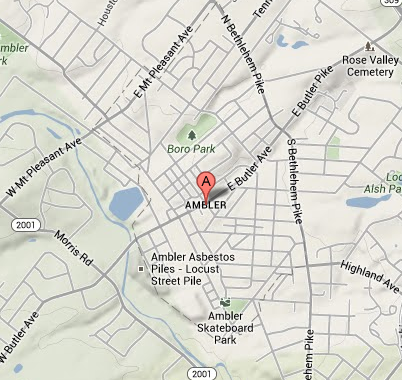 Finally, a note: Accessing the power line easement from the Somerset branch in Warren will almost certainly require construction over a fairly large cemetery. 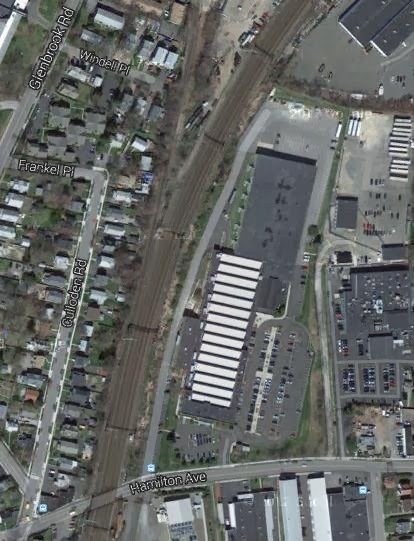 The new Bristol train station would be sited at Franklin Street, where some light industry would be redeveloped into TOD. Indeed, this whole route parallels an extended section of light industry on the east side of Bristol. This may be of use in developing lineside customers. 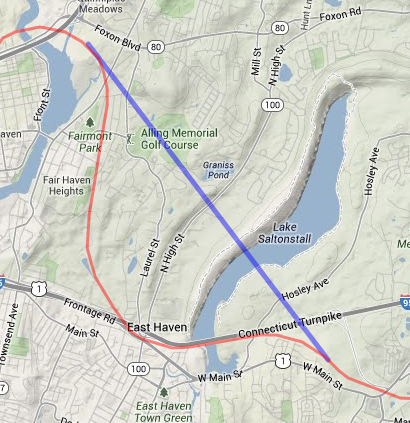 Crossing the bay itself could be done with either (a) a new crossing, or (b) a retrofit of the Mount Hope bridge. For (b) to happen, minor takings of curvature in Bristol Ferry would have to occur, but far more significant would be essentially rebuilding the entire span to significantly heavier loads (not freight-heavy, though) and to have two decks. The current bridge's approach viaducts are rather...spindly...as it is. Actually, due to the relative age of the current bridge (while the structure is pretty, several obvious deficiencies make it a poster child for functional obsolescence), a multimodal reconstruction may well be called for. Figure 4 below shows how a new alignment through Bristol would work with the existing ones. Fig. 4. 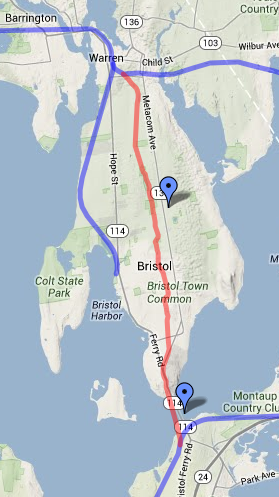 Mount Hope Bay crossing and a new alignment through Bristol, up to Warren. ...link[ing] Providence Station with the old East Side line. Unlike Option C, it does so far closer to the city, linking a short bore tunnel under the Moshassuck and part of College Hill with the existing East Side Railroad Tunnel and running across the Crook Point Bridge. 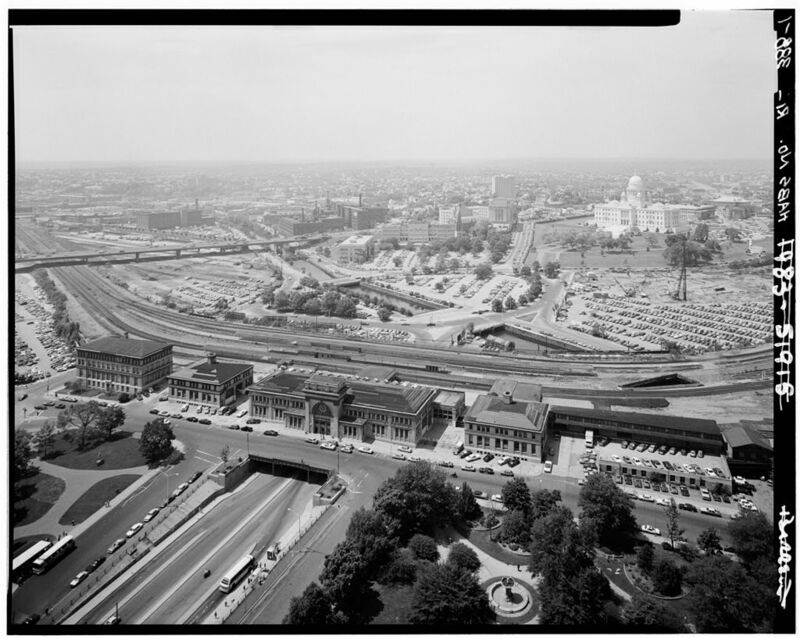 for Providence-centric regional rail, it would be interesting to demolish either One Citizens Plaza or the buildings at the northeast corner of Steeple and Canal and go elevated over either Memorial or Kennedy Plaza). While either way works, I am of the opinion that the short (~4400 feet or 1.4 km) cutoff tunnel to the existing station works better in a larger picture. S-Bahn networks, in particular, like to cluster at the core. That said, since Alon's alignment is a reflection of the NH one, and the railroad also had an alignment up the Seekonk--one still in use today--a network built around a new station over Memorial Drive at Union Station is very much practicable as well. Figure 5 shows how the bored (red) and elevated (black) alignments interact with the existing one (blue). Fig. 5. 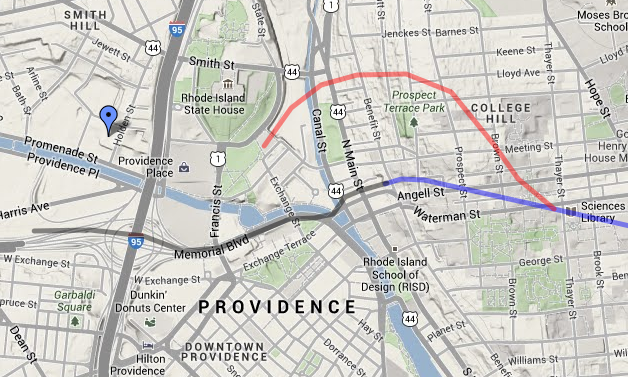 Tunneled (red) and elevated (black) approaches to DT Providence from the East Side Tunnel (blue). Having found the existing easements out of Providence southeast, and analyzed the infrastructural challenges required in turning them into a line (or two), we now have the beginnings of a high-quality statewide network centered in Providence. These southeastern routes are infrastructurally the most challenging; we'll look at other routes later. For now, our final result is Figure 6. *Note that, with Brayton Point's planned 2017 shutdown, opportunity may be had to re-establish the ROW. 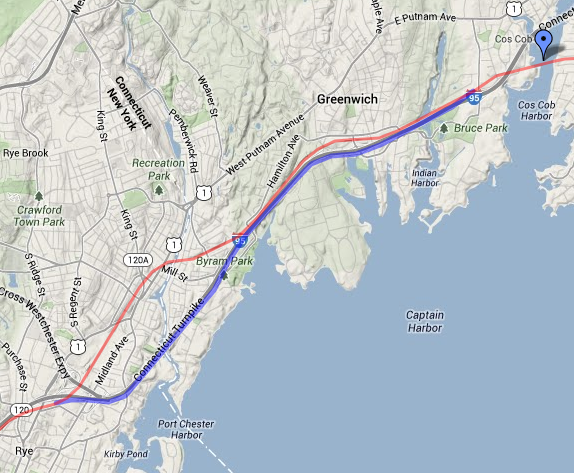 This would greatly ease curvature from the Somerset Branch onto the I-195 alignment. 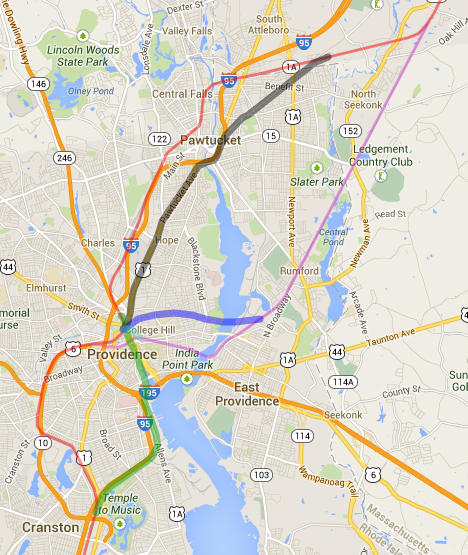 Of all the cities served by the Northeast Corridor (NEC), Providence has the most severe alignment problem. 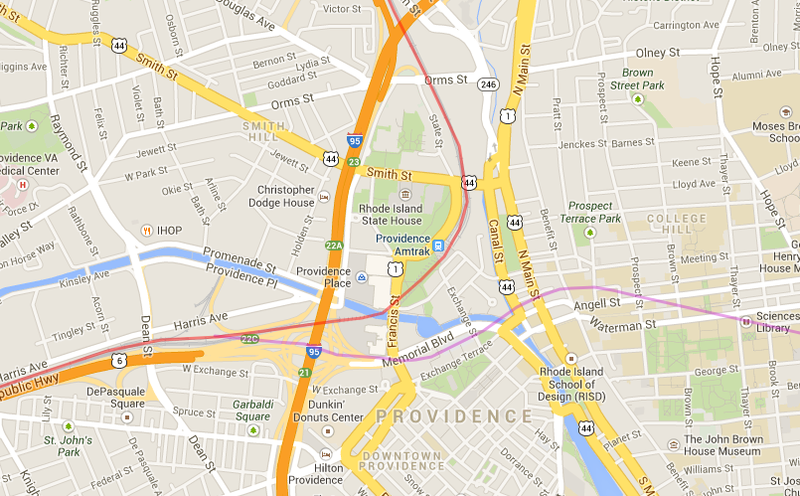 Providence's current alignment is relatively new. It was installed in the 1980s, to reach a new train station replacing one being decommissioned. It is also, in every way, objectively inferior to the alignment it replaced. There are two major deficiencies associated with this alignment: (1) excessively sharp curvature in the station approach, and (2) undersized station facilities. 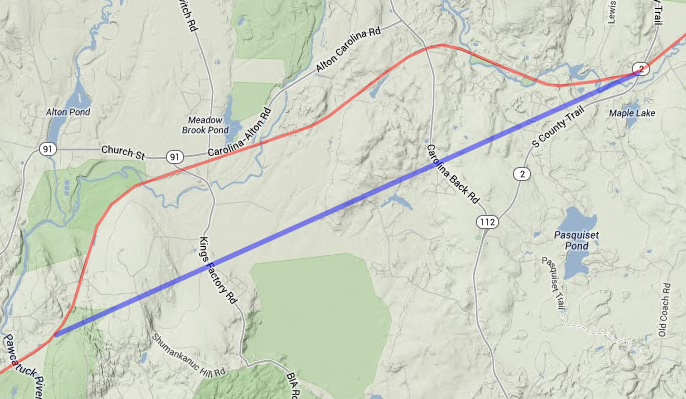 Figure 1 shows the current alignment (in red) and the old New Haven (NH) alignment, where divergent from the modern one (in purple). Figure 2 shows the difference in curvature between the modern and historical alignments. From these figures we can ascertain characteristics of the two alignments. The original NH alignment bypassed Providence city--still in use--to reach its main train station, along Exchange Terrace. There, it crossed the Woonasquatucket and Moshassuck Rivers just above their confluence into the Providence River, and diverged. 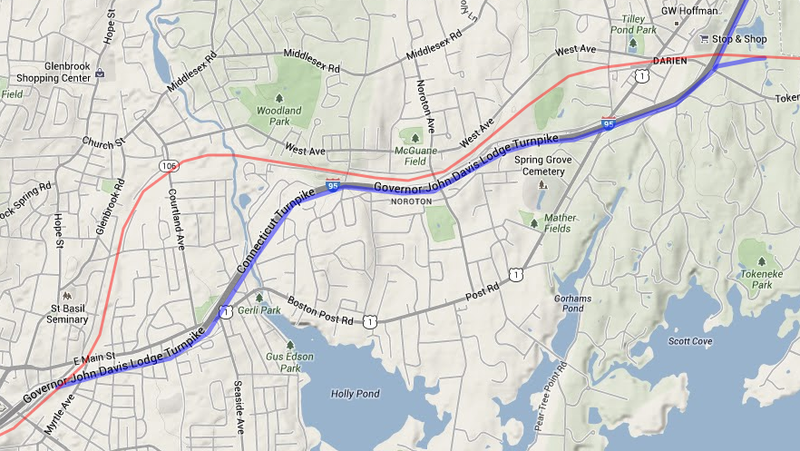 One route headed north to Pawtucket, where it split into routes to Woonsocket and Attleboro. The other crossed Main and Canal streets, and ran through the East Side railroad tunnel, across the Crook Point bridge, and through Rumford and North Seekonk, returning to the NH mainline south of Attleboro. 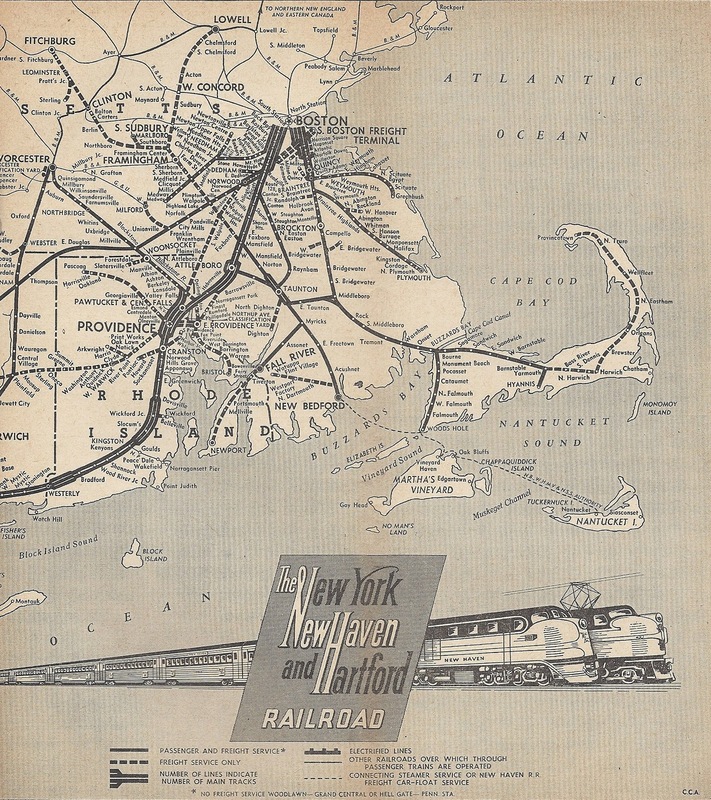 This latter route was built as a freight bypass, but it also proved an important commuter connection from Providence to Bristol and Fall River. The NEC, meanwhile, follows the old NH (originally: Boston & Providence) mainline north to Pawtucket and then east to Attleboro. Providence Station, meanwhile, was built to replace Union Station in the mid-1980s. While it improves on the curvature characteristics viz. the old NH mainline, it appears that planners never considered the superior track geometry the old freight bypass offers. Furthermore, the station was built to handle rail traffic at its nadir, and as traffic is increasing, the station is reaching capacity. Indeed, were Providence to have a fully built-out commuter rail network--one possibility is shown as Figure 3--the station would be utterly incapable of handling the demand load. Worse, its predecessor--although still in place--has seen irreparable damage against any possible return of the railroad. The ROW is unusable between I-95 and Canal Street. Figure 3. 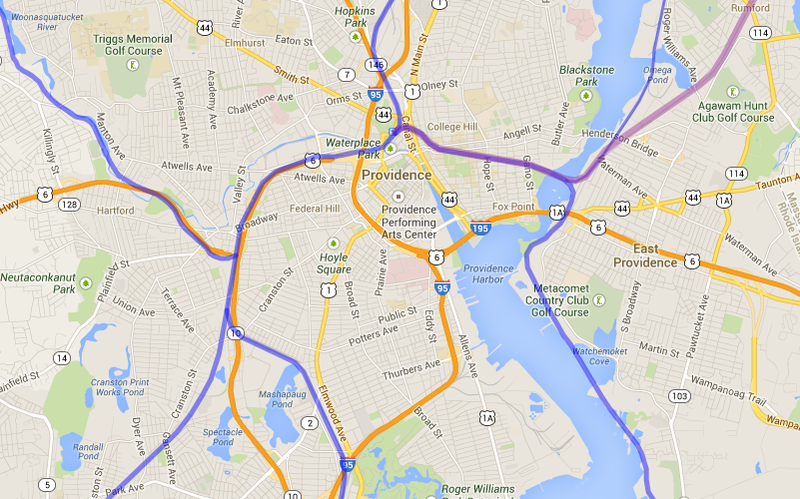 Providence commuter rail possibility. So we now turn our attention to what it would take to actually introduce heavy infrastructure so as to solve these stated problems. Looking to implement low-curvature routes, three options present themselves--each would have its own station facilities. None are cheap. To see the maps I generated for this post, see linked here and here. Figure 4 shows Option A. This option parallels the existing NEC, but eases curvature through the construction of a cut-and-cover tunnel under US 1 to Pawtucket, and along Cottage Ave. thence to the state line. Almost incidentally, it eases the moderate curvature around Pawtucket. The diagram shows some curvature around the Blackstone crossing, as it's assumed to follow existing easements wherever available; a deep bore nullifies that. However, this is a lengthy tunnel--the distance from downtown Providence to the state line is about the same as the length of the Philadelphia tunnel proposal I demolished at length some time ago. And while Providence's infrastructural need is greater than Philadelphia's, one look at the old NH freight bypass suggests it's not that much greater. Figure 5 shows Option B. This was the first option that drew my eye on the map--the idea is to eliminate the station curve entirely, something none of the other options do. Unlike Option A, the tunnel is of moderate length. But also unlike any other option, this one suffers from multiple shortfalls. First, it's the only option with extensive sub-water-table tunneling. The alignment is quite literally waterside. Unlike any other alignment, an entirely new intercity station site must be built--and the best place looks to be quite literally under the confluence of the Woonasquatucket and Moshassuck rivers into the Providence. Part of this alignment lies under semi-active port facilities. And finally, this alignment has a sharp curve that just will not go away. It offers no time savings over the existing Providence bypass. Figure 6 shows Option C. This alignment would run a new deep-bore tunnel under the East Side and link up with the old NH freight bypass--with excellent track geometry--in East Providence. Its curvature, while constant, is also gentle, and it has far less length, and hence cost, associated with it than Option A. It is still, however, a deep bore tunnel. Figure 7. Option D: "Option-C-cheap"
Figure 7 shows Option D, or perhaps "Option-C-cheap". Like Option C, it links Providence Station with the old East Side line. Unlike Option C, it does so far closer to the city, linking a short bore tunnel under the Moshassuck and part of College Hill with the existing East Side Railroad Tunnel and running across the Crook Point Bridge. However, in some ways this proposal reeks of a penny-wise, pound-foolish attitude. Not only does it itself have the sharpest curve of all the proposals, despite its brevity, it also fails to ameliorate the lone sharp curve on the NH alignment--at Crook Point. It is perhaps better suited to regional rail than true HSR. Finally, please note Figure 8 below, with all four options superimposed on the legacy alignments, to give one a sense of how each of these stack up against each other. Figure 8. All four proposals to the same scale. Option C clearly wins out--but it is not quite the most incrementalist approach available. That would be to start with Option D, implementing Option C as and when further funds become available--perhaps as part of a package dedicated to fixing Along the Shore's significant curvature issues in Connecticut. In the meantime, Option D offers expanded station facilities, a better Amtrak alignment, and a platform to develop better--and perhaps, eventually, comprehensive--Rhode Island rail service. A look at the core of Figure 3's schematic--Figure 9--displays this, with the East Side line and Option D linked up to create an S-Bahn-esque core. Ultimately, while Providence's future is its own, what the New Haven left behind was a framework of easements that can provide it with excellent commuter rail. 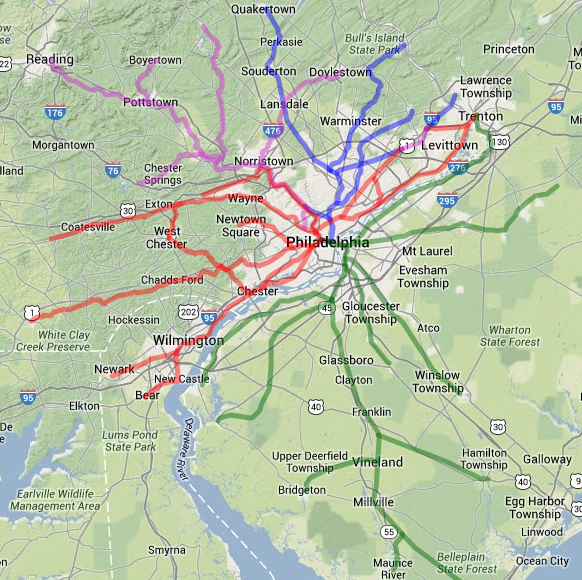 And what the Northeast Corridor needs today is HSR geometry. Hopefully we can do the right, the incremental thing--reactivating the substantial underutilized/disused infrastructure, while judiciously inserting HSR infrastructure where needed. This needs Organisation vor Elektronik vor Beton to happen, though--not the Beton-first mindset our transit agencies always seem to have. 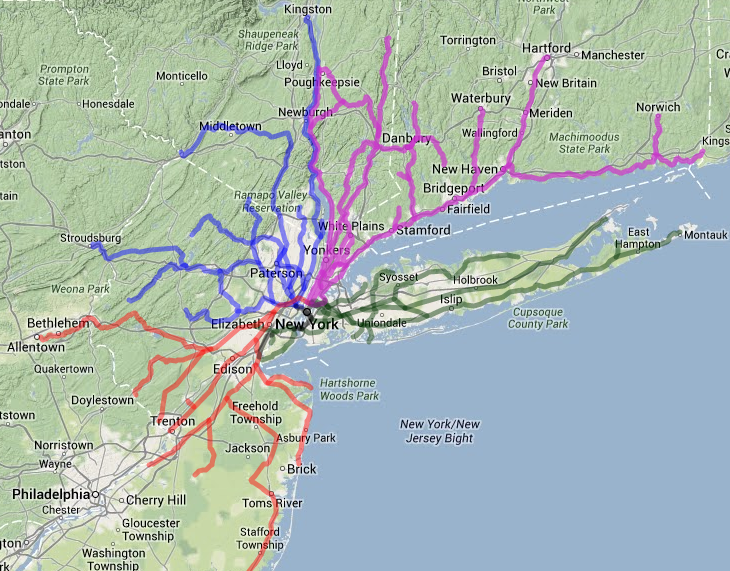 Yesterday, Alon Levy offered a critique of the Regional Plan Association's Metro-North critique. As this post is framed in the context of his Northeast Corridor--and especially his Connecticut--recommendations, it aims to do two things: clarify visually his ideas, and offer my own. 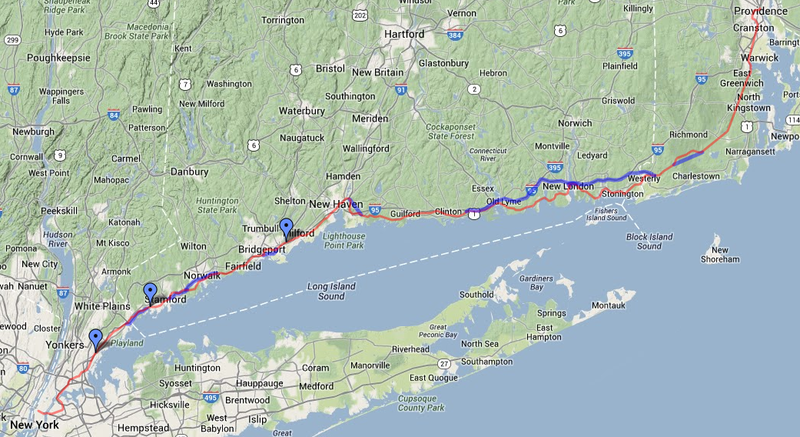 The "Along the Shore" Line is the name I have heard given to the New Haven's (NH) principal mainline through Connecticut, running, well, along the shore. In Figure 1, above, Along the Shore is the thin red line; the blue blisters are various HSR bypasses of curvature or clearance issues; and the placemarks are important standalone features. See the map here. 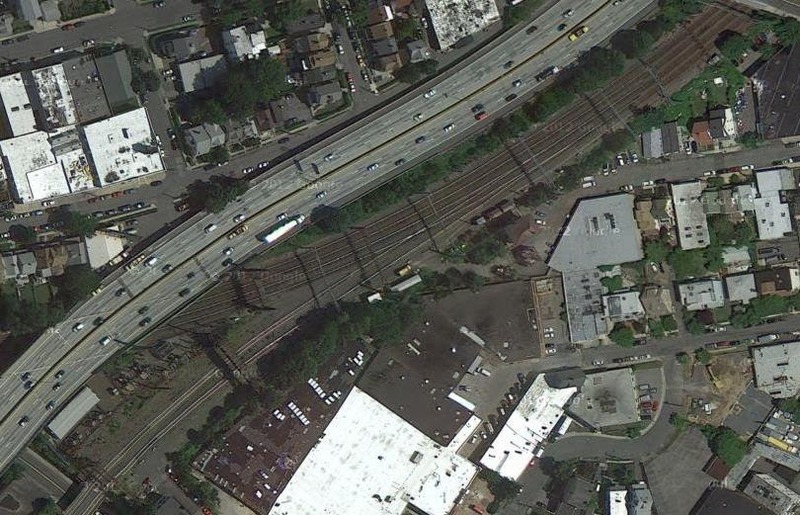 Working from west to east, the first major feature is Shell Interlocking, where the Hell Gate line--the NH's connection to the former Pennsylvania Railroad--meets the NH mainline, which connects to the former New York Central Railroad in nearby Mount Vernon. Shell (Fig. 2) is a flat junction in a reverse curve; to ensure good performance, track straightening is needed, as is a flyover or duckunder for conflicting moves. North of Shell is the first major bypass of NH curves, at Port Chester. This bypass begins just east of Rye Station (new interlocking RYE) and follows I-95 as a bypass of three major curves and a moderate one through Port Chester and Greenwich before returning to the mainline just west of Cos Cob station (new interlocking COB) (Fig. 3). The Cos Cob bridge over the Mianus River is the next placemark (Fig. 4). 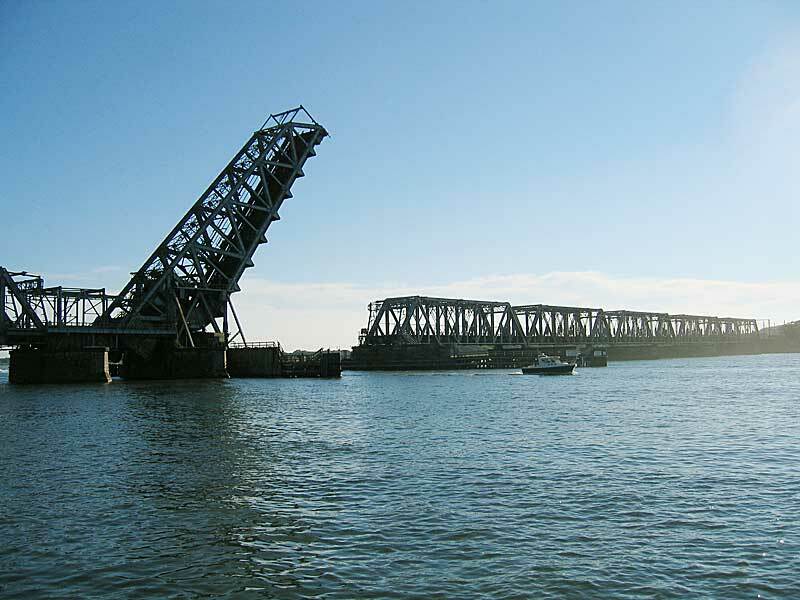 This bridge is an aging bascule bridge; as HSR cannot afford delays due to lift bridges, this needs to be replaced, and raised to allow marina traffic to clear the span. East of Stamford is the second major bypass, at Noroton (Fig. 5). This begins just east of Stamford yard (at new interlocking NOROTON) and bypasses the flat junction Glenbrook Interlocking and curvature associated with it (Fig. 6, below). 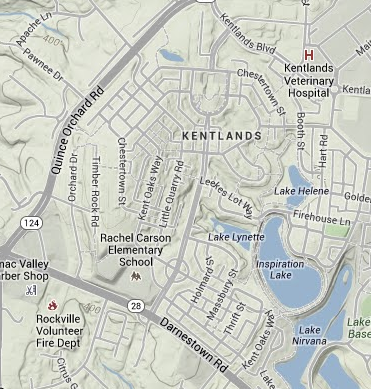 This bypass terminates just east of Darien (at new interlocking DARIEN), where it connects to the mainline and also to Norwalk bypass (sub.). This is because Noroton bypass is meant to be used not just by nonstops, but also by limited-stops that stop at Norwalk and Stamford, but none of the intervening stops, thereby relegating the flat junction to locals. 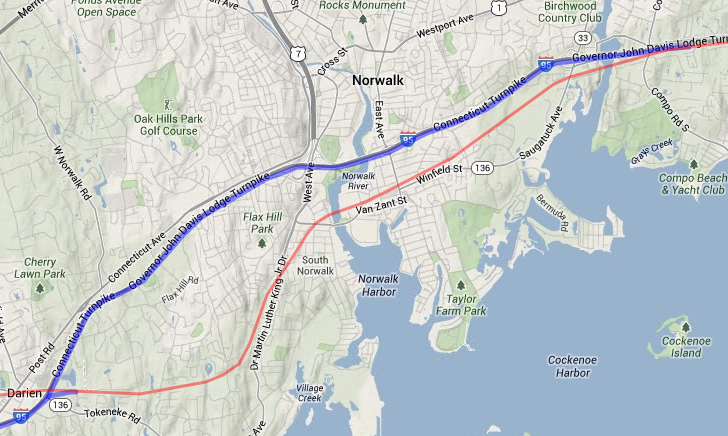 From Darien Interlocking, the Norwalk bypass extends along I-95 through Norwalk (Fig. 7). This bypass eases some sharp curvature just west of town. 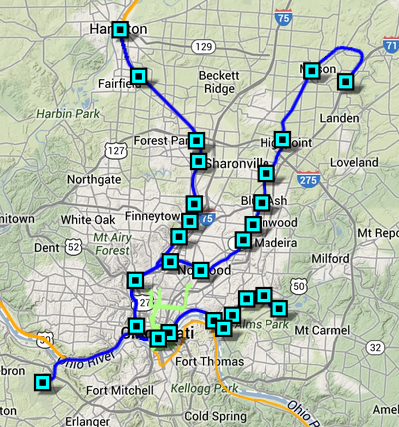 But more importantly, it bypasses Walk (Fig. 8) and Saga (Fig. 9) bridges across the Norwalk and Saugatuck rivers, respectively. That it does the latter is a quirk of geometry--but it also means that neither bridge will carry HSR. Bridgeport has a pair of severe curves on either side of its station. I-95 also has a moderate curve here; mitigating this will require a new easement (Fig. 10) from just prior of the south curve (new interlocking BRIDGE*) to just west of Stratford station (new interlocking PORT). Incidentally, this will require a fixed-link bypass of Peck bridge across the Pequonnock river (Fig. 11). Northeast of here is Devon bridge across the Housatonic (Fig. 12). This bridge, like the Cos Cob bridge, needs replacing and raising, in order to be a fixed link. While New Haven is all-stops, and this observation is relatively minor, it is worth noting that the junction under Ferry Street (Fig. 13) is, unsurprisingly, flat. 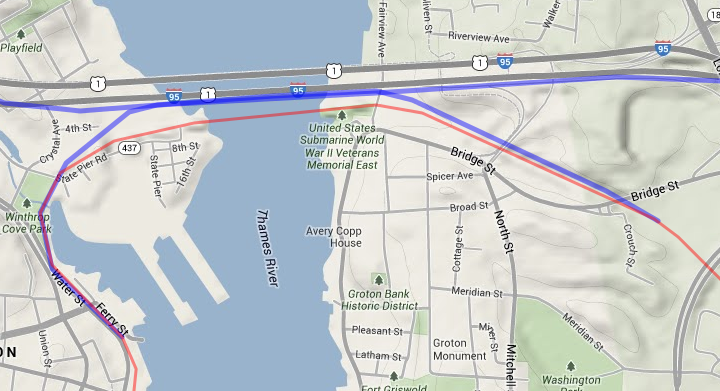 A new easement is needed just east of New Haven, due to two other reasons: (a) the curve from New Haven to East Haven needs bypassing, and (b) the I-95 alignment does not offer a viable substitution. Fig. 14 shows a the tangent such an easement would roughly need to follow. The Long Bypass is the longest of the major bypasses (Fig. 15). Its length is due to two facts: (a) the Along the Shore east of Old Saybrook is marked by a combination of lift bridges and sharp curvature, and (b) the replacement alignment, I-95, follows a markedly inland course. An issue of note is the "hump" above the Niantic river, where 95 converges with 395. A virgin easement may be required across the Niantic's top--fingers crossed, I hope not. Three of these bridges (Figs. 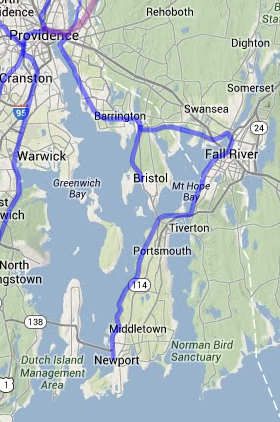 16, 17, and 18) cross the Connecticut, Niantic, and Mystic rivers, respectively. Of particular interest is the fourth crossing (Fig. 19) of the Thames River. This is because of two reasons: (a) the Long Bypass and Along the Shore at at their closest here, and (b) the old bridge (Fig. 20) can be replaced with a high-span fixed link that accommodates both expresses (utilizing the Long Bypass) and regionals (utilizing Along the Shore). Space is available for bridge spirals, thereby reducing the amount of times the old bridge--now utilized by freight--needs to be opened. Figure 21. Rhode Island easement concern? A final note (Fig. 21) pertains to a couple of moderate curves in rural Rhode Island, north of Charlestown. While replacement is not necessarily a priority, takings are inexpensive here, and a straighter easement (such as along my tangent line) could be developed. Past this point, the line has excellent track geometry--the Acela hits its full speed here--north to Providence. Providence has some curvature issues of its own, but we'll talk more about those later. *Which would also replace current Port Interlocking in functionality, incidentally.